Here’s what you need to know about fire-rated glass and framing codes to get started on your next project. What do I need to know about fire-rated glass codes? The International Building Code (IBC) lays out many requirements for the use of fire-rated glass and framing in the United States. As the IBC changes every few years, it is important to keep-up with the latest requirements. This section summarizes key fire-rated glazing code changes over the past 10 years. Contact TGP to learn more about code requirements in Canada and the Middle East. Which International Building Code (IBC) updates do I need to be aware of? Code requirements for fire-rated glazing can seem complex and challenging. Here are some key points to help you navigate your way to appropriate product selections under the International Building Code. As with other code matters, it is crucial to confirm fire safety requirements with the authority having jurisdiction (AHJ). Limitations on the use of traditional wired glass – As of the 2006 IBC, traditional wired glass is prohibited in hazardous locations in all building types. Fire-rated glazing in hazardous locations, including doors, sidelites, windows near the floor and other areas at risk for impact, must also meet impact safety testing standards. Simplified label scheme for fire-rated glazing – the 2012 IBC introduced a streamlined set of markings to indicate the allowed locations for a given product (doors, openings and walls), if it passes the hose stream test, if it meets temperature rise criteria, and the fire rating in minutes (2012 IBC Table 716.3). Use of automatic sprinklers disallowed during fire tests – Prior to the 2012 IBC, some fire-rated glass manufacturers used sprinklers to help their products pass the fire test. Now, to earn a fire rating, products must pass the test based on their own performance, and not as protected by supplemental systems (2012 IBC section 703.4). Clarified requirements for fire-protective and fire-resistive glazing – the 2012 IBC updated product tables to clarify where fire-protective and fire-resistive products are allowed or prohibited, the required minimum ratings and how the glass should be marked (2012 IBC Tables 716.5 and 716.6). Which fire-rated glass codes apply to my project? While the International Building Code is in use throughout the U.S., the version in use varies widely by jurisdiction, which has important implications for allowable fire-rated glass products. IBC versions currently being used include 2006, 2009, 2012 and 2015. The 2018 IBC is now coming online, and the International Code Council’s next set of IBC updates is scheduled for 2021 release. Consult the ICC and your local authority having jurisdiction to determine which codes you need to follow. Even if your jurisdiction is not using the latest code edition, to enhance occupant safety in your buildings, consider using a more rigorous, updated code, as the ICC frequently debates and revises codes applicable to fire-rated glass, to take into account the latest research and product options. What common code mistakes should be avoided? 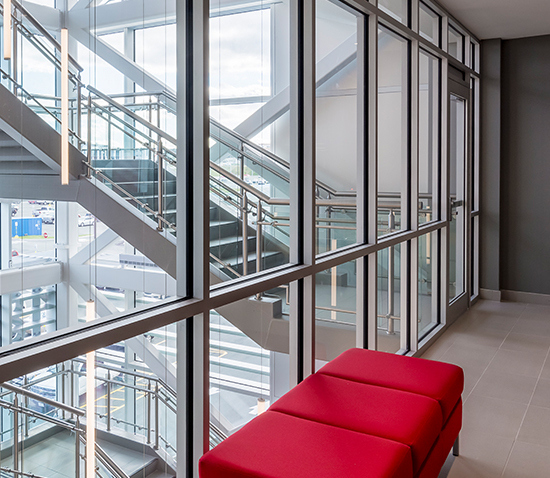 With the frequent code changes related to fire-rated glass, and sometimes misleading marketing messages from glazing suppliers, it can be challenging to know what is acceptable when specifying fire-rated glass and frames. Misuse of traditional wired glass: Although traditional wired glass was the workhorse of fire-rated glazing for decades, because products shatter upon impact and can create dangerous wire snags, as of the 2006 IBC the material is prohibited in locations where people might run into it, in all building types. Traditional wired glass is acceptable in applications where it will not be impacted, such as transoms. Some manufacturers also offer wired glass with a surface-applied film that allows for an impact safety rating. Inconsistent ratings among glazing system components: A common mistake is specifying fire-rated glass and framing with inconsistent ratings and performance levels. To ensure building occupant safety, it is important to confirm the fire-rated glass and frames provide the same level of defense against the spread of fire (fire protection or fire resistance). It also is crucial to verify all assembly components have the same or greater ratings than the required code minimums for the opening. This includes the frame, glass, seals and other components. Since product verification can require a significant amount of due diligence, a good way to guide proper specification is to work with a manufacturer or supplier that offers fire-rated glass assemblies from a single source. In such cases, all the components are designed and tested in the same assembly. Over-reliance on sprinklers: In some circumstances, the International Building Code allows for a lower, one-hour fire-rating for exit corridors where automatic sprinkler systems are in place. The idea is that shifting money from building compartmentation to sprinklers is an effective and affordable way to protect occupants against fire. While sprinklers do much to save lives, they are no substitute for the use of passive fire-rated glazing materials. If sprinklers do not activate due to faulty manufacturing, loss of water pressure, or other reasons, fire-rated glass will perform its critical function of compartmentation—with or without water from the sprinklers. 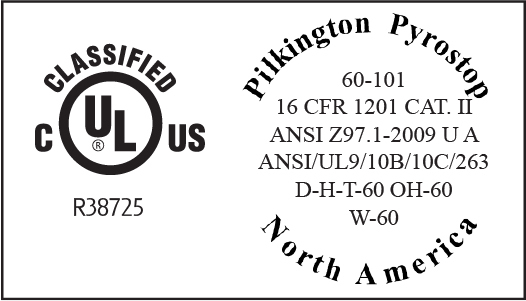 How do I read a fire-rated glass label? As of the 2012 edition, the International Building Code requires fire-rated glazing to include a multifaceted product label code that building and design professionals can reference to quickly evaluate a product’s performance capabilities. The last marking on the fire-rated glazing label is a two- or three-digit number that shows the fire rating in minutes (e.g., 45, 90, 120). The given number corresponds with independent lab testing in accordance with national fire test standards. Putting all this together, a product labeled “D-H-T-60” and “OH-60” is suitable for use within door assemblies and openings, has passed the required hose stream test, does meet temperature rise criteria, and is fire-rated for 60 minutes. For additional information and label samples, see our IBC Label Guide. * For SI, °C = [(°F) -32]/1.8.